The American reality TV series “Toy Hunter” follows a toy dealer on a quest to buy and sell (and sometimes collect) rare and vintage toys. From Barbie dolls to action figures, and even the occasional toy R/C car, this is the most fun toy-based TV show I’ve ever seen. “Toy Hunter” is currently airing on the Travel Channel in the USA, and has just started it’s second season. The show follows toy dealer Jordan Hembrough, as he traverses the USA looking for rare and valuable toys that he can buy and resell, either through his store or at toy fairs. 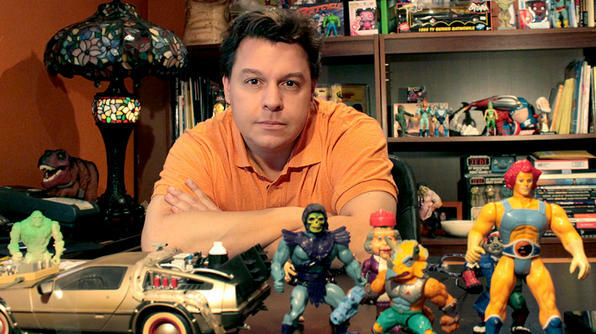 Jordan has apparently been collecting, buying and selling toys for over 25 years, and while a good deal of the show is devoted to the excitement of the high dollar values to be made from various toys, it seems pretty clear that he simply loves toys and is a collector himself. Each episode’s premise is based around Jordan trying to make a profit from the things he finds, while also enthusing about the toys themselves, and their history. Some viewers may feel it’s a cynical cash-grab at times, especially when Jordan goes burrowing through the attics of other toy collectors who are looking to offload some items, only to offer them half (or less) the price that he later sells them for. But having watched the entire series to date, it’s worth noting that no-one is forced to sell him anything. He also flies and drives all over the USA to see and buy items in person. And he has his own staff to pay. What’s more, he’s usually pretty up-front in telling people that if he’s offering them $200 for something, he’s hoping to sell it for $400 (if they didn’t know it already). In more than one instance, he’s even refused to accept a seller’s price because it was too low and voluntarily paid them a far higher figure (in one case, he refused to pay $600 and paid $2000 instead!). But if there’s still more money to be made, why would anyone sell to a middle-man like Jordan? Why not just take matters into their own hands and use eBay or something? It’s a good question. And in fact, the word “eBay” is never mentioned in the show either… (but let’s face it, eBay doesn’t need any free promotion). Well, even in this age of the Internet where anyone can theoretically connect with anyone else, those connections don’t always happen. 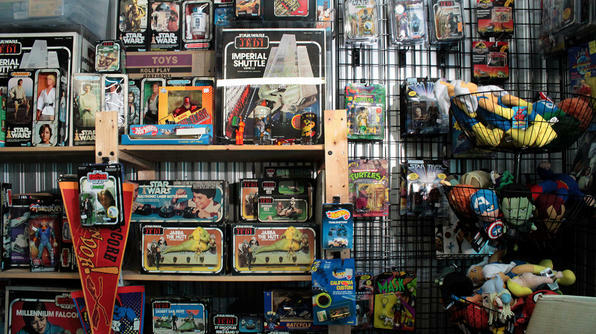 Jordan apparently has a list of over 10,000 clients, so if he buys a rare toy for $1000 from someone, the key for him is to know just the right collector who will pay more for it. While eBay and other auction sites are a good way to sell things most of the time, I am always amazed by the number of “Wanted” ads I see for items that are either available somewhere on the Internet right now, or were available recently. There are a lot of people out there who don’t search thoroughly for collectibles, and many who just do short bursts of enthusiastic searching, and then give up. So if Jordan keeps an up-to-date list of who wants what among all the serious toy collectors he knows, it’s not so hard to see how he might fulfill the role of connecting people with the items they want. Particularly when it comes to ultra rare pieces. And as for the sellers, well… selling online can be a real hassle at times. Advertising, dealing with customers, packing, posting… it can easily consume your life if you have a lot to sell. To some people, the convenience of having a collector walk into their home and offer them $100 for something, will be worth the extra $50 they’ll lose by not going to the trouble of selling it themselves. What’s more, if you think the worldwide audience of selling things on the Internet will always guarantee the highest price, then guess again. The Internet is where I go to find bargains! (Don’t you?) It can’t be both a premium marketplace, and a bargain basement, at the same time. There are constant ebbs and flows, and the toys I collect often sell for vastly different figures one week to the next. And sometimes a moderate but guaranteed price is actually better than the uncertainty of the web. But enough about the politics and money, because as Jordan often says – you should only collect what you love anyway. And for all it’s staged price negotiations, cash register “cha-ching!”s and digging through boxes, Toy Hunter has been great fun so far. At it’s core it’s just a show purely about toys, how cool they are, and how much fun it is to rediscover and collect the old ones. Has there ever been a prime-time TV show about that before? It’s a nice sign of our times that enough adults are able to enjoy collecting and reminiscing about old toys, that it’s an activity able to sustain a weekly TV show. And last but not least, what about R/C cars? Even though many of the toys featured aren’t items I collect personally (there’s a heavy focus on action figures in particular), it’s still interesting to learn about them and their collectibility, not to mention seeing the vast sheds, attics, barns and sometimes bedrooms that people use to hoard them. And the show hasn’t been entirely without R/C toys either – at least a couple of basic ones have appeared, not least of which was the time when Jordan was contacted by Gene Simmons from KISS and given the challenge of finding a KISS artefact that he didn’t already own (Gene’s showroom/mansion filled with KISS memorabilia is beyond words). Here’s the Toy Hunter website, but if you enjoy the show I’d also suggest you check Youtube to see more clips and episodes. Hello, I have ,built, child tested the 1st Lionel remote control train in 1982…wondered if you may be interested ? I have (2) 1985 Bandai Power Marchers. Hitchhiker & Quickstep. I was told these were (2) of the (3) first prototypes made in Japan. And on the back it says Patent P. They are in pretty good shape, but I can’t find any information on them. If you have any interest or information it would be very appreciated. Big Fan excellent show.